M:6cm 2.36″ Suitable for children aged 5-7. L:6.5cm 2.56″@Specially – Specially Design for Children Boy Girl Child. @Adjustable – The sticky Buckle is applied to gloves. Never worry about any hand type. It is so easy adjust the tension according to your personal needs. 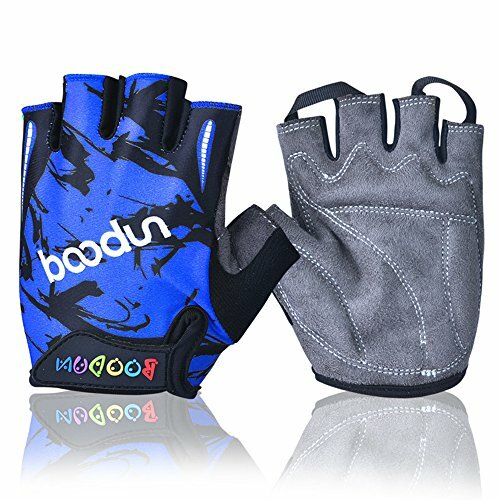 [It is most flexible to use your half Finger gloves in cycling, rock climbing, BMX, motorcycle, driving, jogging, workout, hiking and other activities. @Absorb Sweat – Bike gloves are mainly used to sweat-wicking Towel Cloth for all sport lovers to easier wide and wick moisture away from the skin and dries quickly, which can warmly keep you cooler and comfortable during you enjoy the activities. @Breathable – Gloves to be made of Lycra spandex and specially designed excellent elastic Knitted Mesh Fabric, which is washable and durable. The construction of Knitted Mesh FabricIt is tough and not easy to cause deformation. It is lightweight and breathable. @Child Size: – Palm Width: M:6cm 2.36″ Suitable for children aged 5-7. L:6.5cm 2.56″ Suitable for children aged 8-10.. Gloves with 100% satisfaction after-sales service for you. We would like to take care of you better than anyone else no matter what the conditions! If not, all your money back or a replacement guaranteed.